My name is Rhodri Pugh and I started teaching in 2004. My previous background is in electronics, running machines and training people to run the machines. I enjoyed the teaching side, so that is what made me decide to become a driving instructor. I have learnt that 99% of pupils are very nervous/excited on the first few lessons. It's part of my job to ease these nerves and I believe my teaching techniques work very well to accomplish this. I don't want my pupils thinking their lessons are a chore, its very important that they are relaxed and enjoy the lessons. My relaxed method of teaching enables this and makes the teaching a faster experience. It doesn't matter what age you are. I have taught pupils from the ages of 16 to 74 and I will vary my method to suit you. If a pupil has a disability, I am able take that into account when teaching and adapt my approach to suit the individual pupil. 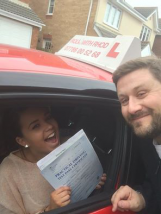 My lessons are not just about passing your test, my aim is to make you a confident and careful driver after you have passed and are on the roads by yourself. My lessons are taught in an Audi A1. Its an amazing car to learn in and very easy to drive.